If you’ve been starved for answers as to what in the world has been going on in Deathstroke these last few months...prepare to go hungry a little longer. Deathstroke #38, written by Christopher Priest, with pencils by Fernando Pasarin, inks by Jason Paz, and colors by Jeromy Cox, only serves to confound its readers even more. 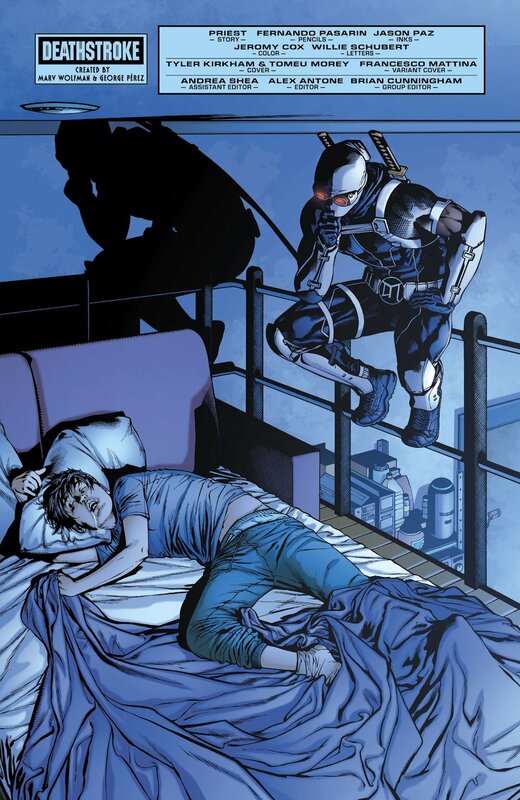 Previously, Slade Wilson was betrayed by those closest to him and committed to the infamous Arkham Asylum. Once inside, he was drugged and made to believe he was actually losing his mind. Or, maybe he actually is losing his mind. It’s unclear, at this point, what is real, and what isn’t. Now, Two Face has kidnapped Slade’s daughter Rose, his “imaginary” fellow inmate Dev is on the outside looking for answers, and Slade is so doped up on meds, he’s swimming in his own brain. Priest continues to supply twists and turn in his mystery this issue, but it’s gotten to a point where nothing is making sense. Equal parts intriguing and frustrating, it’s impossible to tell if this is a good mystery, or just a bunch of nonsense that’s impossible to figure out. There seems to be decent evidence that Slade didn’t imagine his trip into space with Dev, considering his partner is walking around out in the real world, despite the Arkham doctor telling Wilson that he doesn’t exist. But there’s also the fact that there seem to be two Two Faces, with Harvey Dent admitting to Rose that he is somehow in two places at once. It’s possible the readers are being led down a path where they must ask what is real in this story, only to find out that nothing is real at all. If that is, indeed, the case, then this entire story will live or die by the skill level of the execution of that reveal. The B plot of Rose Wilson’s “possession” continues to drag down the arc. Even with the introduction of Two Face into this side of the story, it just seems like filler to meet Priest’s page number goal. If the idea of Rose being possessed isn’t nonsensical enough, Dent’s interest in her is even more far-fetched. Hopefully, Priest can find a way to connect this side plot to the main story in a more meaningful way in the coming issues, because as of right now, it just feels superfluous and unenjoyable. The art team, on the other hand, turns in some of the best work in current DC Comics this issue. Pasarin’s ability to tell a visually stunning, clear, well-acted story puts this book on a whole other level. Not only does he have a flashy style that’s pleasing to the eye, but he can deliver the goods in action and story layout, as well. Paz and Cox, on inks and colors, also manage to elevate this story to the next level. Their vibrant and pitch-perfect tones make a story about a man trapped in an asylum still seem like eye candy, which is no small feat. Priest better treat this team well, because they could easily hop over to a bigger book, and make a huge splash there any time they want. In the end, despite Priest still building a decent mystery, it feels like he should be starting to zero in on some answers, (or, at least big hints about answers). Instead, he is just piling confusing questions on top of even more confusing questions. If there isn’t, at least, something pointing in the direction of answers starting next issue, it’s going to start seeming like an exercise in futility trying to make sense of this arc.